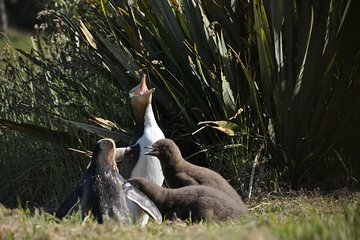 Overhold gule øjne pingviner i deres nesteplant på en lille gruppe tur fra Dunedin til Otago-halvøen. Hør informativ fortælling om dette vildtreservat og nyd flotte foto ops fra forskellige udkig. Først skal du tage en rundvisningstur til Dunedins største vartegn, herunder Otago Universitet og Dunedin Botanic Garden. Opgrader din oplevelse med et 1-timers stop ved Royal Albatross Center for et kig på et kongelig albatross-kolonihytteområde med en specialistguide. Inkluderer afhentning og frafald fra dit hotel eller krydstogtshavn. We were with Iconic Wildlife Tour. The owner Kim was our tour guide and the driver. With anotherr couple not showing, my wife and I were Kim's sole guests so that we had enjoyed the whole day very personal attention and guidance. I am sure that experience would've been the same even with more participants, given Kim's professionalism and warm kindness. The only draw back was that the view of yellow-eyed penguines was cancelled due to the death of all chicks as a result of severe hot weather the week before ... : sad both for the demise of chicks and our tour! But, Kim had kindly refunded part of our tour cost. Kim literally drove us on the high - and low roads to watch other birds. He was especially determined for us to witness the beautiful Albatross, which was the highlight and we did .... what a view and experience! We loved the tour at every single moment! Highly recommended to go with Iconic Wildlife Tour and we wish you all could go see yellow-eyed penguine. The all day tour with Alan Hansen could not have been better. We were met at the pier as arranged and were somewhat surprised that it was a private tour with only Alan, myself and my wife. He was extremely informative, giving us a great deal of information about the geography, history,political, and economic climate of New Zealand and the Otago Peninsula. Plenty of time to see the sights and to have an in depth discussion about life in New Zealand. Could not have had a better time. Saw seals, penguins, albatrosses and other wildlife. Alan was especially terrific. Would recommend this tour to anyone. Extremely reasonable price. Probably a 4 and a half, instead of a 5, but very, very good. The mountain top was shrouded in clouds not the tour company's fault, and the penguins and Albatross center were VERY enjoyable, but not as much to see as we had hoped. Other sights were fine, nothing speactacular, and always a little rushed, but all in all, very nice! It was a rainy day, not the fault of the Tour Co. but it made for a bad day. The Penguins that we were shown were, first in a hospital only 3 or so, and second in a preserve of which there was one. It was disappointing as the advert made it seem as if we would see many birds - probably at sea, or nesting. The time of year was the problem, but that fact was not addressed prior to booking. Also seeing the Royal Albatross required a walk up and down a steep path - which again was not listed before booking. My wife and I are both a bit rickety and we cannot walk or climb well anymore. We were both disappointed in the tour. Small tour bus from Viator for wildlife tour which picked us up from the cruise terminal, we drove through town on the way towards the Penguins. We learned about the endangered yellow eyed blue penguins and got to see their program to shelter injured penguins and the process of reintegrating them into natural environment. There is a moderate amount of walking in various places during the day. We walked by the coast to see some of the fur seals basking in the sun. I would have liked to go to the Lamach castle but the guide stated we didn't have time. We did however, spend time at the Albatross center even though we didn't opt for it . We saw some albatross flying above but it got so windy cold, we had to go inside after awhile. This was very scenic and enjoyed the nature part of this trip but recommend getting the specifics of the day in writing so they don't change it on you. Diese Tour wurde von Iconic Tours durchgeführt. Unser Führer hieß Kim und war super klasse. Er war nett, freundlich, ging auf alle Fragen ein. Wir waren eine kleine Gruppe von 10 Personen, das war sehr schön. Die Organisation war perfekt, die Erlebnisse bei den Pinguinen und Albatrossen einmalig. Die Landschaft auf der Otago Peninsula ist traumhaft schön. Kim fuhr dann einen anderen Weg nach Dunedin wieder zurück damit wir möglichst viel von der Landschaft sehen können. Er hat uns auch einiges in Dunedin gezeigt. Der Tag war sehr schön, erlebnisreich und wir wollen ihn auf keinen Fall missen. Großes Lob an unseren grandiosen Reiseführer Kim. The first part of the tour was good. Our guide, Kim, took us to the steepest street, the Railroad Station and drove around the Octogon part of town. The scenery was beautiful as we drove to the Otago Peninsula, but once there it became a bit disappointing. There was only one penguin to see. The description of the tour led me to believe that we would see many more. There was not much to do the rest of our time there. Kim got us back in plenty of time to board the ship as we drove through Port Chalmers. Really enjoyed this Tour. There were only 5 of us and the driver Kim made sure we saw some extra's. We Loved the beautiful buildings and the craftsmanship involved. We saw beautiful gardens and Yellow eyed penguins. We also were amazed to see the Albatross gliding through the air.